It’s a bit disconcerting really that some of our most beloved toys from childhood are now considered retro and even collectible items these days! But we don’t look at these toys with an eye for a quick buck, but rather with a fondly nostalgic eye for all the fun memories that we had with them. Whether your tastes ran to action figures, planes, construction toys, video games, make and do kits and more, the toy industry was and still is a place of wonder with some marvellous and innovative ideas to keep kids of all ages interested. One thing that we can consider lucky though, is that we pre-date the mobile phone era and easy internet access than modern-day kids are familiar with practically before they can walk, so we were much more inclined to either meet up with friends in person, actually make things and get outside a bit more too. Read on to find out about some of our favourite toys from our childhoods. So even though these come under retro, there is still a booming market for Airfix models today, although perhaps it is more amongst avid model builders rather than your normal everyday child. Many of us will remember getting the slim Airfix glider model in our stocking for example, and more elaborate WWII fighter plane kits for bigger presents that our dads would inevitably end up finishing. There was nothing quite so satisfying as following the instructions to glue, strut and assemble the plane before getting to the fun part of painting it before hanging it from our ceilings. Airfix models actually taught us some great skills such as patience, instruction reading which is now really useful when we have to assemble IKEA furniture, and the joy of making something by ourselves! This one was perhaps more likely to be gifted to a girl, but it’s true that watching a magic garden bloom and flourish is pretty cool. 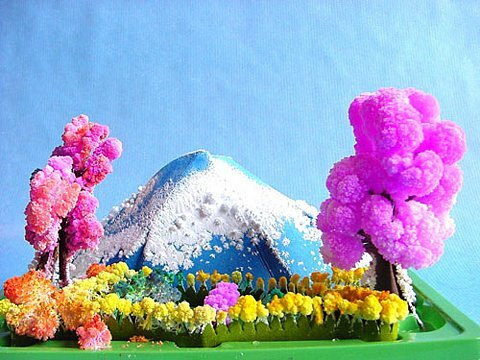 Basically it is more of a science project than a frivolous toy since it is a chemical reaction that causes the crystals to ‘bloom’ and with their different colours, give the impression of a flowering garden. With grass, different flower colours and even snow this toy works thanks to the saturated crystal solution which is drawn up into the paper shapes which have soluble dyes in the tips. It is pretty technical actually, but the crystals start to appear after around 2 hours, and if you leave it overnight, in the morning there you will have your garden like magic! Kites have been around since ancient times, and still bring pleasure today to kids and adults alike. From Chinese fighting kites to kiddy ones that are perfect for the beach, and even home-made affairs, succeeding in flying a kite is so satisfying, and the perfect way to while away a windy afternoon. Kites are still one of those things that you can easily find in discount stores, toy shops and even supermarkets, so why go fly a kite? !